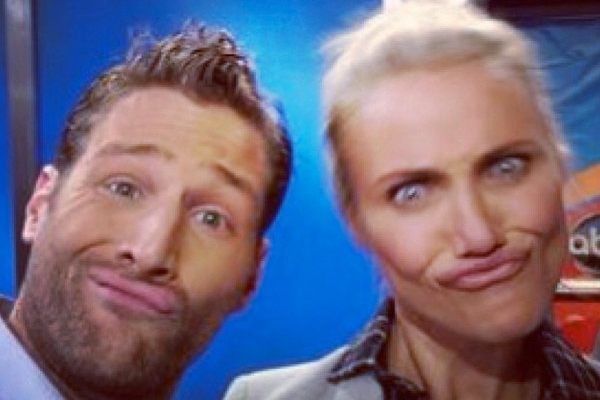 The Bachelor‘s Juan Pablo met Cameron Diaz and the stars of Girls on the set of Good Morning America Monday morning. During a fun backstage meet, The Bachelor star Juan Pablo Galavis met Cameron Diaz and the actresses of Girls, Lena Dunham and Allison Williams, while appearing on Good Morning America Monday, Jan. 6. The fun group shared some good times while appearing on GMA and posted a few photos as evidence of their backstage party. First up, the reality love-seeker Instagrammed a picture of himself with Diaz as they made funny faces together. In the photos, Galavis and Diaz both look at the camera with pursed lips, making hilarious duck faces. Galavis’ turn on The Bachelor began on Sunday night with a special episode featuring his current life in Miami. While on GMA, the single father of one dished on what’s to come for his season, which begins on Monday night, and he spilled on a few details. While Galavis does not say whether he finds love at the end of the show, it is unlikely, given his charm, that he won’t end up proposing to someone on the finale.